We have always believed that the vision of the church should center and revolve around what God is doing in His Creation. The church exists, not for its own mission but to accomplish and steward the mission of God and represent His Presence to peoples of the earth. 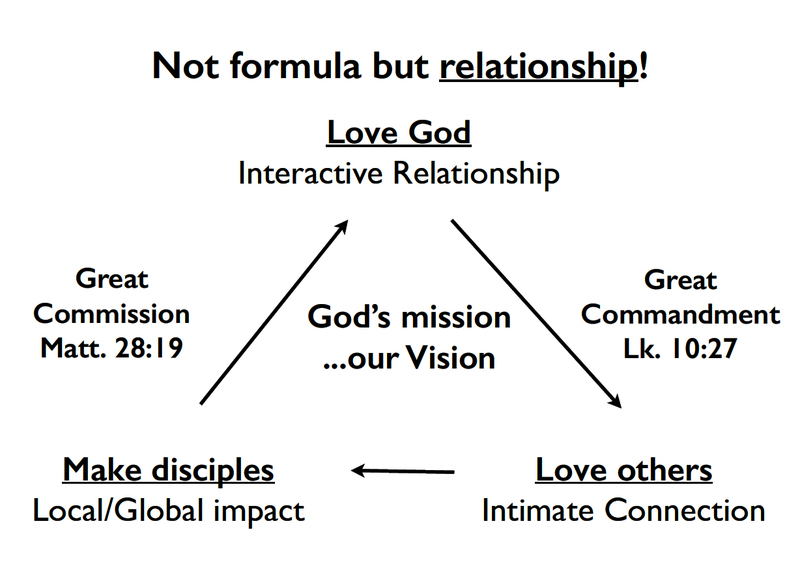 We understand the mission and vision of God to center around six primary axes. “Simon Peter answered and said, You are the Christ, the Son of the living God.” The Rock of revelation of who Jesus is as the Christ is the cornerstone of this great promise. The Great Mission. Luke 19:10. “…For the Son of Man has come to seek and to save that which was lost. God has called us to be a church that is responding to God’s love for us by Loving God with all our heart, mind, soul and strength, through worship and service. God has called us to learn to love the people around, both in the church and those outside of her fellowship. This requires that we see people as God sees them! SHARING JESUS WITH THOSE WE MEET. Our intent is to share Jesus with the people we meet along life’s way. Outreach and Evangelism are key functions here.